J, you are correct, the 1908 course ended at the then western terminus of the Motor Parkway near the Bethpage Lodge at Round Swamp Road. The drivers made a left turn and went about 200 feet on Round Swamp Road before turning on to Manetto Hill Road (now called Old Bethpage Road). 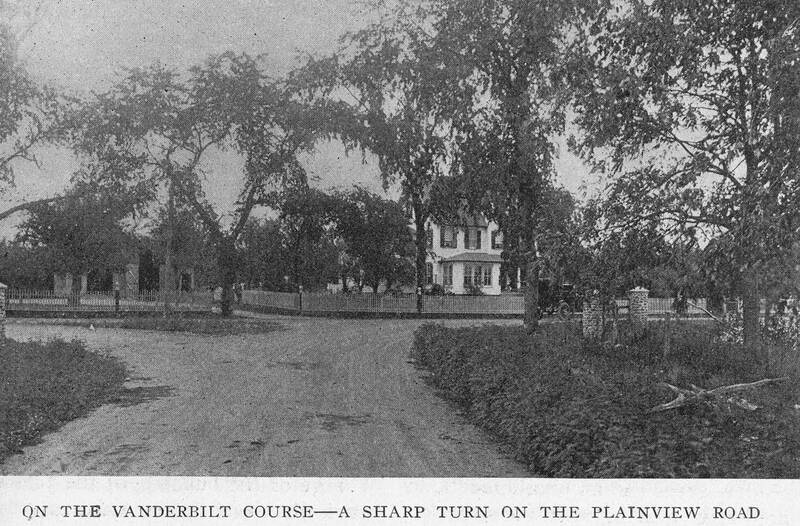 Despite the American Automobile Association's October 1906 goal of never again using public roads for the Vanderbilt Cup Races, the 1908 course was made up of 9 miles of the Long Island Motor Parkway and 14.46 miles of public roads including; Round Swamp Road, Old Bethpage Road, Manetto Hill Road, Planview Road, Jericho Turnpike, and Ellison Road. 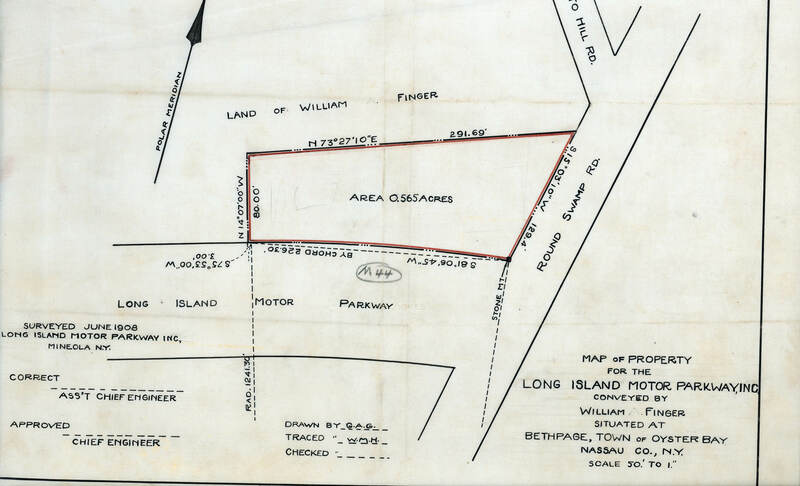 This survey from my collection shows how the Motor Parkway ended at Round Swamp Road in June 1908.The Bethpage Lodge was located in the red section north of the parkway. 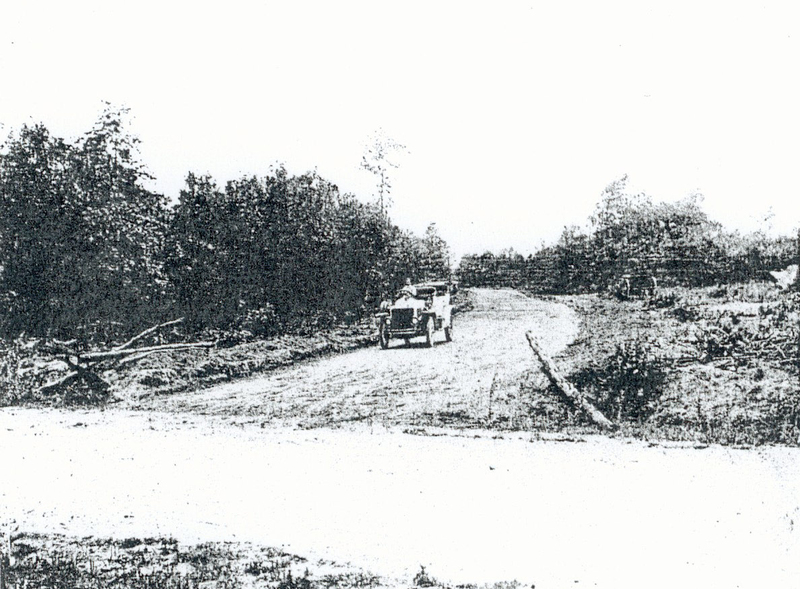 This is an August 1908 view of the Motor Parway looking west from Round Swamp Road. What time is the presentation on Dec. 8 at the Southold Hist. Soc.? I am interested in the names of the roads (both then and now) that made up the eastern end of the public roads for the 1908 race. The LIMP ended at Round Swamp Road, and the race headed north. indicates that the road now called Round Swamp Road was travelled only briefly, and the course followed what is now Old Bethpage Road (which now, at least, briefly merges into Plainview Road just south of Old Country Road). North of Old Country Road, the course follows what is currently known as Manetto Hill Road. At Colyer’s Corner, the course turned right onto what is now Woodbury Road & then left onto Jericho Tpk. indicates that the road from Hicksville to Colyer’s Corner was called Woodbury Road in 1908 (as it is still today). It is very likely the section after Colyer’s Corner to Jericho Tpke also was called Woodbury even in 1908. The same source suggests that 1> Manetto Hill Road and Old Bethpage Road were (either together or partly) called Plainview Road in 1908 - or 2> one passed “through Plainview” Road (meaning “crossed”) when heading to the Bethpage Lodge. However, the use of “through” for Round Swamp Rd indicates the former interpretation is more likely. However, the road now called Plainview Rd is clearly on the 1908 map & was travelled only briefly (between current Old Bethpage & Old Country roads). Various other roads were also called Plainview Rd even in the 1960s. I think it likely that current Manetto Hill Rd may have been called Plainview Rd in 1908. 1> Round Swamp Road is not shown to extend to Old Country Road (though it might), and the map suggests a sharp right might be needed to stay on Round Swamp Rd (which race course does not do) when heading north. 3> Until 1936, current Old Bethpage was called Bethpage, and current Bethpage was called Central Park. Old Bethpage Road would likely not have that name until 1936 at least. As you noted, the names of the roads in this area have clearly changed over the last 101 years. The above pdf article on the course as published in Auto Topics on August 8, 1908 probably adds to the confusion. I will continue to research this area and show my results over the next week or two. I believe I have also just found a 1908 race scene shot at the interscetion of the Bethpage Lodge entrance and Round Swamp Road.